GREEN BAY, Wis. — New Packers coach Matt LaFleur had a long to-do list even before his players arrived for the start of offseason workouts this week. Enveloped by controversies that predated his arrival in January, LaFleur faces the challenge of turning around a franchise that reached the playoffs eight consecutive seasons — including one Super Bowl victory and two more appearances in conference championship games — before having back-to-back losing seasons for the first time since the early 1990s. It’s going to take more than a fresh coat of paint down the hallway that leads from the locker room to the field and reassigned seats in the team meeting room to get the Packers back into championship contention. “We had a standard here of going to the playoffs every single year,” Rodgers said Wednesday. “We did that eight years in a row and we were competitive and in the mix, and then the last couple of years, obviously, have been frustrating to finish. Rodgers and LaFleur will be at the center of reaching those expectations. Rodgers, 35, played through a serious knee injury to start all 16 games last season, but endured one of his worst years of his career. 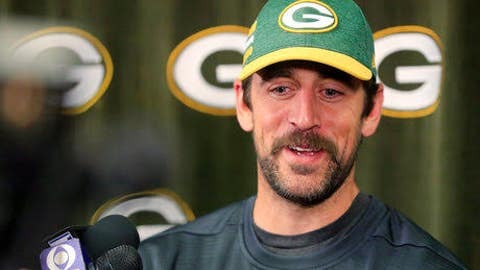 LaFleur, 39, will be tasked with getting Rodgers back to his two-time MVP form and changing the culture of a team that had hit hard times during the final two seasons of McCarthy’s 13-year tenure. After running McCarthy’s offense throughout his first 11 seasons as starting quarterback, Rodgers is getting his first taste of what LaFleur wants to do. At the scouting combine in February, LaFleur said offensive success required a “partnership” between himself and Rodgers. A new coach and new playbook aren’t the only big changes. Two longtime stalwarts, receiver Randall Cobb and linebacker Clay Matthews, departed in free agency. Meanwhile, they added outside linebackers Za’Darius Smith and Preston Smith, safety Adrian Amos and offensive lineman Billy Turner in free agency. A pair of first-round picks will infuse more talent. “Change, it can be really good if you embrace it,” Rodgers said. Echoing what LaFleur has said, Rodgers added the play caller/quarterback relationship will be critical to reversing the team’s fortunes. Rodgers talked to one of LaFleur’s former pupils, a Falcons quarterback Matt Ryan, to get a gauge on his new boss. Impressed by what he heard, and with his injured knee healed, Rodgers was eager to get to Green Bay to start fostering that relationship and to shake off the sting of last season’s 6-9-1 debacle. “Having that much time off was different,” said Rodgers, who had grown accustomed to playing into January. “I know many of us were itching to get back here and get started. Anytime you’ve gone through a stretch like we went through where everything was very similar — similar faces, there might be some changes, similar plays, similar environment you’re working in — you get used to that and accustomed that.